‘ANNIE JR’ playing at The Arts Theatre March 23-25 starring one of CLG’s students. 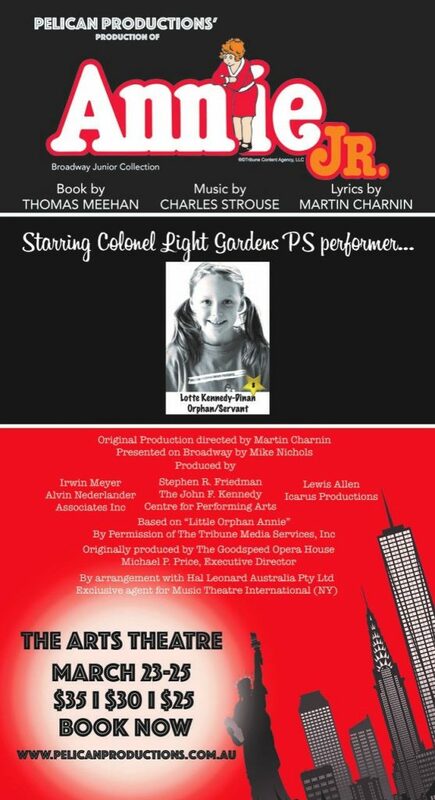 It will be starring one of CLG’s students Lotte (Year 4) who would love to see some familiar faces in the audience! Hot off the heels of a very successful award-winning 2017 season, production company Pelican Productions brings one of the world’s best loved musicals, ‘Annie JR’ to the stage in March. Based on the popular comic strip by Harold Gray, Annie has become a worldwide phenomenon and was the winner of seven Tony Awards, including Best Musical. The beloved book and score by Tony Award winners, Thomas Meehan, Charles Strouse and Martin Charnin, features some of the greatest musical theatre hits ever written, including “Tomorrow”, “Hard Knock Life” and so many more. Playing at the Arts Theatre, Angas Street, March 23 – 25. Tickets are on sale now through www.pelicanproductions.com.au. Adults $35, Concession $30 and Children $25. Suitable for all ages. Lotte will be in the “Cast 1” performances. This entry was posted in Previous Posts on March 21, 2018 by clgpschool.